For many people Switzerland evokes ideas of Alpine tranquillity, not to mention excellent time-keeping and scrumptious chocolate. 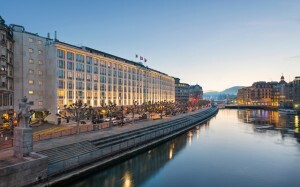 However its flagship city of Geneva often surprises visitors, who are immediately enchanted by its cosmopolitan vibe, its slick facade, and of course the sparkling waters of one of Europe’s largest lakes nearby. If you’re joining the many often wealthy visitors from all across the globe and heading to this very special city soon, then here are some tips for where you can go and what you can enjoy. One of the most iconic features of Geneva’s cityscape is its famous Jet d’Eau, a fountain of water which shoots as high as 140 metres into the air and which dates back all the way to 1891. You can view it from a distance and admire it while elegantly illuminated during the night, or alternatively you can head up the pathway that leads to the very top of the Jet d’Eau, though you should be prepared to get rather wet if you decide to go up! Back on the ground check out the Cathedrale St Pierre, with towers that you can climb to enjoy a spectacular view of the rest of the city and the surrounding region. Beside the cathedral you can also explore the Old Town, passing the time visiting the antique shops as well as the house where Rousseau was born. As well as it being blessed with a rich and fascinating history, Geneva remains a crucial geopolitical centre with all kinds of major world organisations committed to peace and harmony based there in the heart of this quintessentially neutral nation. Visit the Palais des Nations, with its magnificent Assembly Hall which once housed the League of Nations, as well as a wide collection of public art, a library and immaculately landscaped grounds open for your enjoyment. You can also explore the Museum of the International Committee of the Red Cross, as well as various other museums dedicated to art and natural history. Then when you’ve explored the sights, the museums and the galleries that Geneva has in abundance, as well as spent a bit of your Swiss francs in the boutiques and the cafes, you can get some much needed rest in the city’s green space. Especially worth a visit is the Parc des Bastions, a tree-lined space which is also home to the University of Geneva. With so much to see and do it makes sense to stay for enough time at a good resort like the city’s five-star Kempinski hotel. That way you can make the most of your stay in the best possible surroundings and truly enjoy what the city has to offer.